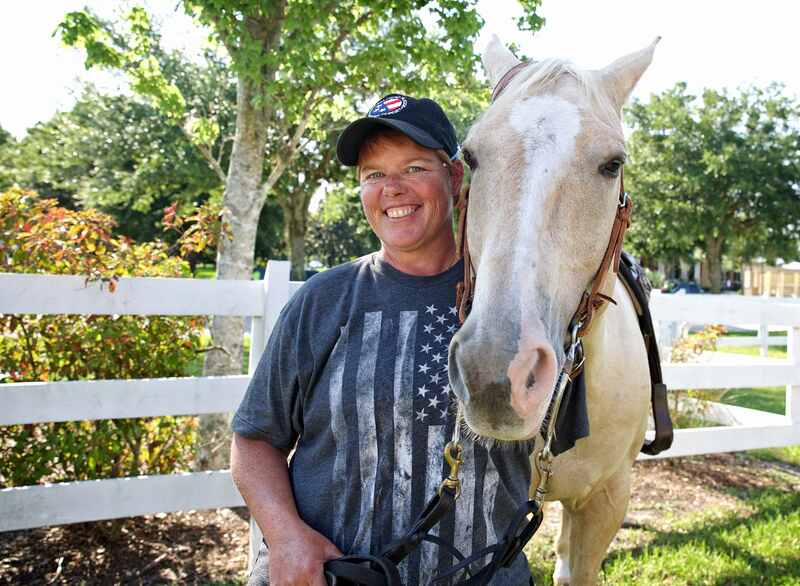 Kelly Smith grew up in Osceola County around horses, but never dreamed they would have the power to help her cope with losing her left arm in combat. The TV show will air on Sunday, July 3 at 7 p.m. and highlight the stories of Smith, and Christopher Gordon, another veteran helped by the equestrian therapy program. Dr. Monroe says horses are great therapists because they are sensitive to non-verbal communication and can easily become skittish around sudden movements or noises. Because of those traits, they can teach veterans how to manage their emotions and energy. The animals’ unconditional love provides support, and the physical activity of riding improves balance, core strength and movement for veterans with traumatic brain injuries and amputations. Early research studies have shown a marked reduction in anxiety and depression among veterans in the program, and with the equestrian center in full operation, Dr. Monroe hopes to do more extensive research to develop best practices for riding therapy. Osceola County agreed to build an equestrian center after hearing the early results of equestrian therapy. The $1.75 million facility is at Chisholm Park about 20 minutes from the medical school. The new center will allow riding sessions year-round because of its roofed riding area that can protect participants from the rain and sun. Smith, who grew up around horses and other animals in her St. Cloud hometown, is one of the first women veterans to go through the program. She was injured during her service in Iraq and had her arm amputated several years later. “When I lost my arm, I had a pretty tough time of it,” Smith shared. “It was not so much the loss of my arm, but it was more so having to get out so early in my career, adjusting to life back from tour and adjusting to my family and kids. A self-proclaimed “city kid” from New York, Gordon, an army veteran who lost his leg in combat, had never been around horses. He had become a bit of a recluse after military service and thought horse therapy would get him out of the house. Dr. Monroe is eager to bring increased attention to the benefits of equestrian therapy.